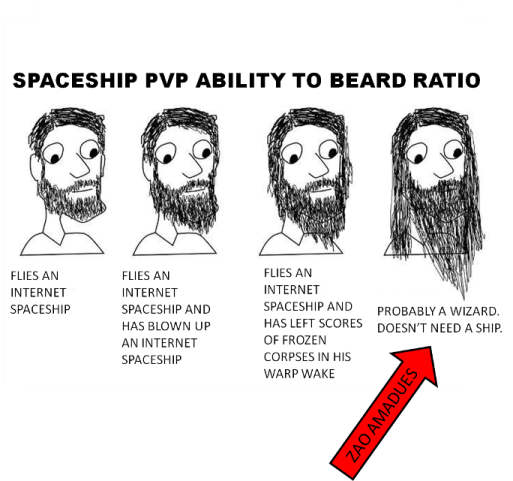 Trolling along the internet highway, somewhat drunken and lost after recording Episode 16 of Highdrag, I stumbled upon a simple graphic that illustrated beard ratios. I decided to EVEize it; the result is below. First, for those of you that follow the cast, and for those of you that follow certain Twitch streams, Zao Amadues is the guy on the right. The guy is a PVP wizard. 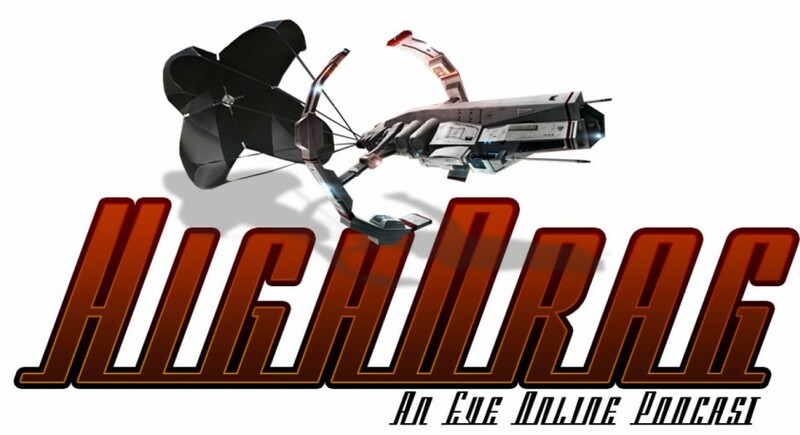 If you haven’t seen his streams, stop reading, right now, and head over there to watch the wizard conjure up spaceship explosions worthy of a space Houdini. Secondly, learning EVE PVP is difficult. If you are constantly low on funds, jumping back into the thick of things by trial and error may not be the most cost effective way of giving your muscles their memory. A more effective way, would be listening to the Tao of Zao on this cast, and watching his Twitch stream. You can learn basics of PVP in just about any ship (because he flies them all) or, for the veterans, you can learn the subtlety of attacking a large gang in a Slicer. Last night, everyone in Zao’s channel watched him coax a calf from a gang, slaughter it, then warp away. Like a lion. A crazy bearded wizard lion. Maybe it’s the Grizzly Wintergreen dip, maybe it’s the beard, I don’t know. What I do know, is that you, dear reader, can learn these techniques from a Wizard. Right now. You just have to make the effort and watch the stream. Oh, and don’t forget to start growing your beard (sorry ladies). Lastly, and since last nights recording (and drinking) forced my hand in writing this post, I wanted to mention that a different kind of wizard is hard at work using trickery to edit Episode 16. Random McNally is the guy that makes all of us Neanderthals coherent in the final cut, a feat no other mortal can accomplish. His wizard beard must drag on the floor behind him. Episode 16 is coming very soon. Coming back to something is never an easy feat. Hopping back on a bicycle after years of slovenly couch like behavior, entering a boxing match after a decade of retirement, or in my case, coming back to EvE after time off is about as rough as traveling to a foreign country without a translator. I had taken the last month and a half off of EVE to reboot myself; The details of why are boring, so I would rather just go into the horror I experienced when I reloaded EVE, and logged in to the realization that I… have.. forgotten… everything. As the station hangar loaded for the first time in a long while, I saw a vaguely familiar outline of a Federation Navy Comet (To hell with every damn Hookbill in the verse). I was in a world that was very familiar, but altogether foreign. Questions like “Nennemalia?!? Why am I in Nennemalia? Did I log off there. It’s been so long.” Began firing in my twitch deprived brain pan. I truly had no idea why I was in the system I was in (I know how my 3 year old feels now, falling asleep in one room, only to wake up in another) Trying to shake of this disorientation, I attempted to bring up my assets so I clicked on a button… my wallet came up instead. To my horror I realized I didn’t recognize the UI icons any more! I quickly closed the eve client and opened up a web browser. I logged into the HighDrag page while simultaneously logging into skype to say “hello” to some of my favorite people. If I was going to get some EvE rehab, these were going to be the people to do it. It’s amazing to me how quickly skills can atrophy in a game like EVE online. The EVE gods giveth and they taketh away I suppose. After only a short time away, I instantly forgot how to read my overview, what fights I should take ( and which fights I should tuck tale and run from) When I should pulse my AB or MWD, what distances I should stay at, what ammo I should load, etc, etc, etc. There is a lot of skill involved with this game of ours, and although it can induce burnout, I learned the very valuable lesson that I will not venture from the universe New Eden for too long. That being said, I am back, and it is good to be back. We are recording our next episode this Wednesday and as always, I have a gigantic bottle of Jesse James Outlaw Bourbon that is going to ensure that this is going to be a good one. Here’s to you, EvE Community. Cheers. Episode 15 brought us a skeleton crew of Ashterothi and Random as they discuss what little they’ve been doing in game recently, and some discussions regarding the proposed HAC changes and some of their observations from Alliance tournament. Sad thing is, by the time the podcast was put together and uploaded, everything had changed. However, in this episode, Random had a chance to interview T3mp3s7 from Pandemic Legion with regards to the upcoming Toronto Meet up in August. Details for the meetup can be found at http://www.facebook.com/events/143575662512526/ or you can contact T3mp3s7 in game or in the Toronto Meet Up chat tab. I was so excited to see RVB and Agony Empire doing very well in Alliance Tourney XI and was a proud and vocal supporter for both teams. Regretfully, RVB was eliminated before the podcast was released but I’m still proud of the team. Go Purple!! There is always next year!! Special recognition for our bed music goes to 3rr0rc0d3 and his website at http://www.minddivided.com. He was kind enough to give permission for the podcast to use his space music. Episode 15’s bed music was provided by the album “Clouded” from the website. Thanks 3rr0r!! Thank you very much for listening! Please give us a review on iTunes! !